John McCain is making no progress in his pursuit of the White House. Our model now projects Barack Obama to win 351 electoral votes to John McCain's 187, and to win the Electoral College 96.7 percent of the time to McCain's 3.3 percent. Both numbers are unchanged from yesterday. Theme #1. If the national polls are tightening, there is no evidence of it in the state numbers. If the national tracking polls moved at all today, they moved slightly in McCain's direction, as he gained ground in the Rasmussen and Research 2000 polls, whereas the other six trackers were essentially flat. However, there has really been no sign of tightening in the state polls. Our model places more emphasis on state polling, and there's a pretty good reason why: they give us a lot more data to look at. Today's for instance, there were 3,539 "fresh" interviews conducted (e.g. those that were not already accounted for in previous' days tracking polls) between eight national polls that we added to our database. By contrast, there were 22,881 fresh interviews conducted between 31 new state polls. If the state polls aren't showing movement toward McCain, then it is probably the case that any perceived movement in the national polls is sampling noise. If anything, in fact, the state polls are showing movement toward Obama on balance, not just in battleground states like Virginia, but also in non-battlegrounds as diverse as New York, Oklahoma, Oregon and Arizona. Theme #2. Obama has begun to run up the score in some non-battlegrounds. Polls in states like Washington, New York and California are now showing very large leads for Barack Obama. As some of these states have large populations, they are providing a bit of cushion to Obama in his popular vote margin. To a lesser extent, Barack Obama has also gained ground in some red states like Arizona and Georgia. As a result, whereas for the past several weeks we had shown Obama as being more likely to win the Electoral College while losing the popular vote, those probabilities have now begun to equalize themselves -- his popular vote was not quite as efficiently distributed as it was before. Theme #3. We are approaching a pollster consensus in some battlegrounds. In certain states, the range of the polls has narrowed. Missouri and North Carolina now look like true toss-ups. Florida looks like a toss-up, leaning Obama. Ohio and Nevada lean clearly toward Obama, but McCain remains within striking distance. 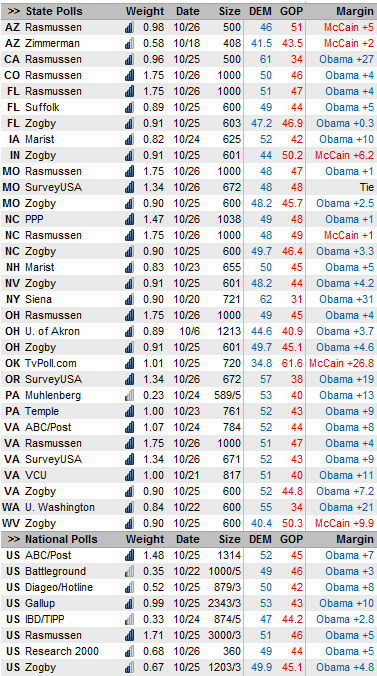 Colorado and Virginia lean more strongly toward Obama, and McCain may or may not be within striking distance. Pennsylvania has failed to tighten materially, and is probably not within striking distance. Likewise, Wisconsin, Minnesota and Iowa appear safe for Obama. States where there is a bit more disagreement are Indiana and New Hampshire. The former can be described as a toss-up and the latter as a lean Obama state, but the range of polling is wider than in most other states. Meanwhile, there has been relatively little polling of New Mexico, and it is hard to tell whether McCain is viable there or not.